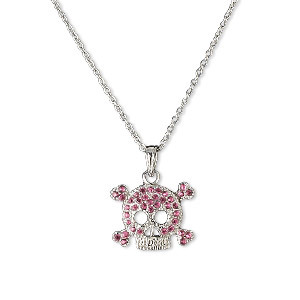 Necklace, silver-finished "pewter" (zinc-based alloy) and steel / brass / Chinese glass rhinestone, dark pink, 21x17mm, 15 inches with lobster claw clasp. Sold Individually. 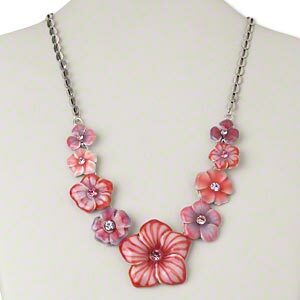 Necklace, epoxy / glass rhinestone / antiqued silver-finished "pewter" (zinc-based alloy) / steel and / or brass, multicolored, 18x17mm-44x42mm graduated flower, 16 inches with 3-1/2 inch extender chain and lobster claw clasp. Sold individually. 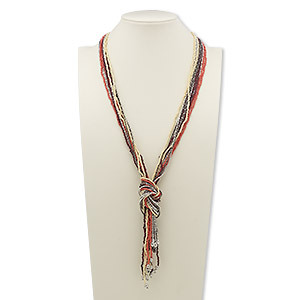 Necklace, 11-strand, glass with silver- and gunmetal-plated steel, brown / cream / salmon pink, 34 inches with knot. Sold individually. 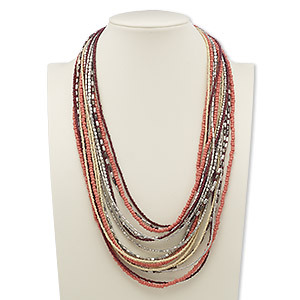 Necklace, 16-strand, glass with silver- and gunmetal-plated steel, red / salmon pink / cream, 24 inches with 2-inch extender chain and lobster claw clasp. Sold individually. Necklace, nylon / glass / silver-plated steel / brass, pink and clear, angel, 18 inches with 2-inch extender chain and lobster claw clasp. Sold individually. 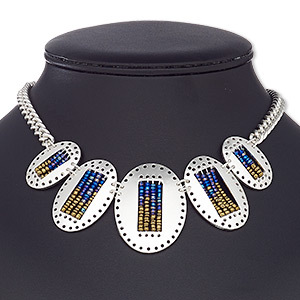 Necklace, glass / silver-coated plastic / silver-plated steel / "pewter" (zinc-based alloy), blue AB and gold, 30x22mm-44x34mm graduated oval, 16 inches with 3-inch extender chain and lobster claw clasp. Sold individually. 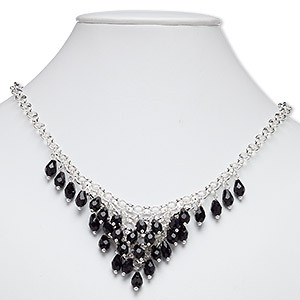 Necklace, glass with silver-plated steel and "pewter" (zinc-based alloy), black, 18 inches with 2-inch extender chain and lobster claw clasp. Sold individually. 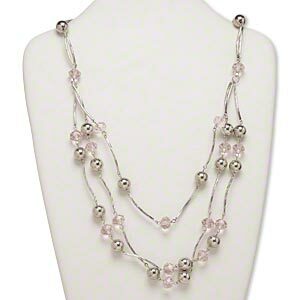 Necklace, glass and imitation rhodium-finished aluminum and steel, pink, 18x18mm faceted rondelle, 23-inches with 2-inch extender chain and lobster claw clasp. Sold individually. 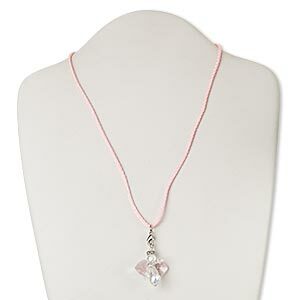 Necklace, glass rhinestone / enamel / silver-finished brass / steel / "pewter" (zinc-based alloy), cream / pink / clear, 11x11mm heart and 16.5x16.5mm flower, 16 inches with 3-inch extender chain and lobster claw clasp. Sold per pkg of 2.